Here's a tip. Want to know how to keep onions from making you cry? 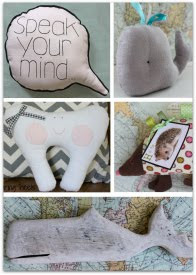 Make them out of felt! 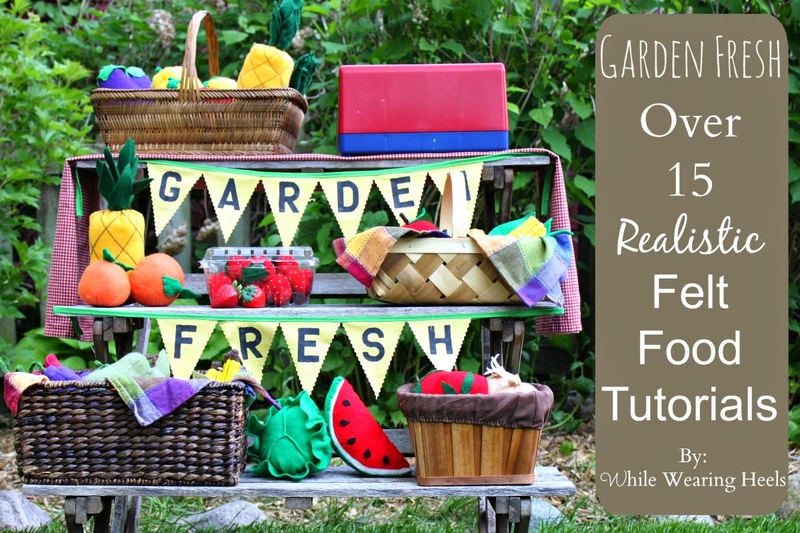 Learn how to make your own felt onions for your child's play kitchen with this easy to follow tutorial. begin to cut your onion out. Place two sections of the onion body together and begin to sew the first side. Start sewing from about a 1/4 of an inch down from the top of the onion body. Sew to the very tip (or bottom) of the onion. Repeat this step for each section of the onion until all the sides have been sewn together. When all sides are sewn together, the top of your onion will look like this.. Turn your onion right side out. Push the bottom of the onion up through the unsewn top. With your fingers, give shape back to your flatten onion. Roll the base of your root up. Insert the root into the top of the onion. Sew the onion top closed just about where your sewing line begins, still leaving the pointed tip of the onion free, using tan thread (I used 2 strands of 438 DMC thread). In this manor, you will sew the root into the body of the onion so it remains firmly in place. 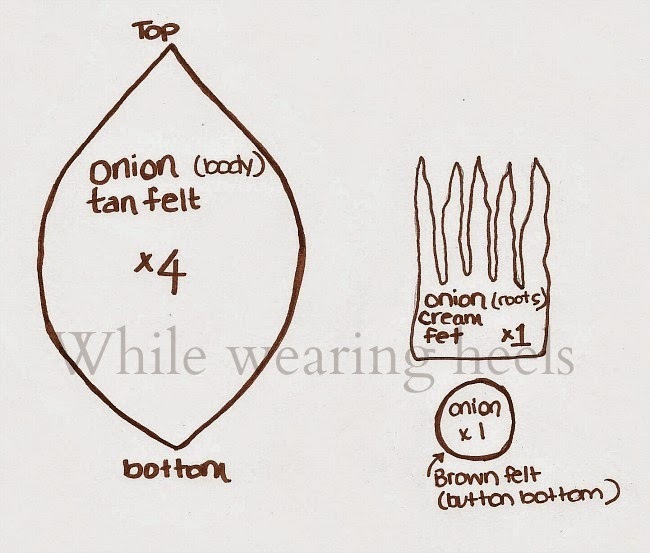 Using your same needle and thread, begin to add some embellishments to the body of your onion. You'll do a long stitch from the top of the onion. To the bottom of the onion. From the bottom of your onion. Back to the top of the onion. Completing 2 straight lines per section, 8 lines in total. With tacky glue, place a dab of glue at the bottom of your onion. Place the dark brown felt circle on top of the glue. Press it down firmly and leave to dry. Finally, step back and admire your hard work. The best part of these onions, they won't make you cry! 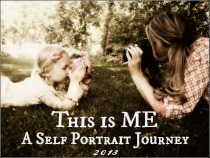 If you enjoyed this tutorial and want to see more, simply...click here. 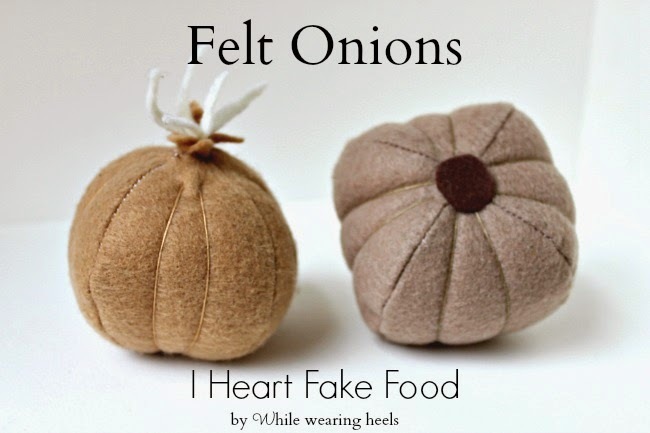 Love your tutorials for felt food. But when I try to download fra Scribd, it says, that it's not set to public download. Thank you for letting me know. I have now included the pattern in the body of the post above. I've never sold one before BUT I'd be happy to work something out with you. Drop me an email whilewearingheels at gmail dot com. If the shoe fits, remember them.